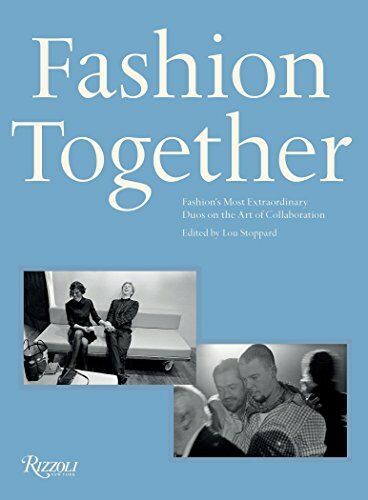 Andrew Bolton of the Metropolitan Museum of Art authored the foreword and Lou Stoppard assembled Fashion Together and conducted the interviews. They offer the history, narrative, and some context of this collaborative effort we know as fashion. What has been written by them might be a tad over intellectualized and possibly over thought, but nonetheless the text is both insightful and informative. What is rather commendable is that Fashion Together does not solely focus on designers but expands the analysis by including photographers, stylists, and pretty much anyone who dwells within the orbit of fashion. In other words this book is not just about clothes and muses and inspirations. There are no limitations here in terms of who and what, the door is wide open when it comes to these collaborations/pairings. A small note here is that since Stoppard is British, there is a strong skewing toward those involved on the other side of the pond. Fashion Together is a collage of 18 redacted interviews between Stoppard and her subjects. The primary or main topic is about the dynamics of working together as a team while involved in some creative process having to do with the world of fashion. What is most stunning in many ways is that the conversations range from intimate to vapid to enlightening to cases of TMI. Some of the interviewees are well known to most and some are further down the food chain when it comes to notoriety. Of course, there are visuals to document these interviews. It is difficult to pinpoint the interviews and offer a general assessment of the book since each interview must be treated separately as its own story and each might appeal to a different category of reader. Of course the common thread is fashion, but there are some very sage words offered by the likes of Phillip Treacy, Nick Knight, and Shaun Leane, just to name a few. There are other interviewees who seem a bit too impressed with themselves or mired in their own self-importance within the sphere of fashion, but again that is just one reader’s opinion. Overall Fashion Together is worth the read if you have the time. Each of the interviews is handled independently with nothing tying them together except the common thread of fashion and thus is easily put down and picked up at one’s leisure. Some readers, even the most well read, will get a behind the scenes insight about fashion as it exists today.